Please click here to buy your TI-Nspire on Amazon. Although I’ve “refreshed” this article about the original TI-Nspire Grayscale (black and white) to include information on the latest operating system upgrades and a little bit on the CX release, I suggest you check out my new TI-Nspire CX Review to learn more about the latest TI-Nspire model. The TI-Nspire CX is a huge upgrade that includes a color screen, backlighting, and a new slim design. In early 2007, I was at the Texas Instruments “T3” conference in Chicago to learn all I could about the TI-84 plus in a single weekend. After hours and hours of sessions, I finally felt confident I knew as much about the TI-84 as a person could learn in a weekend. I decided to check out the exhibit hall. When I got down there, there was a massive group of people huddled around a single exhibit. They were all wowed, checking out the public unveiling of a new Texas Instruments graphing calculator, the TI-Nspire. My initial reaction was to feel deflated. Here, I had invested so much time in learning the TI-84 (much more than a single weekend), and now I’d have to start over. It didn’t take long, however, before my reaction changed to awe. Over the last three years, I’ve spent countless hours teaching, coaching math team, and training other teachers on the TI-Nspire. 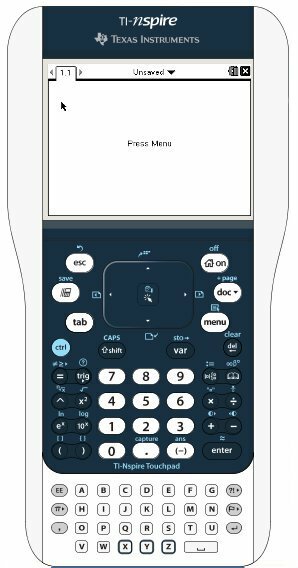 Although I feel there are a lot of strong graphing calculator choices for students on the market today, the TI-Nspire is the first visionary calculator of the 21st century. Who is the TI-Nspire designed for? Every math student. Some Texas Instruments products have been designed more for the beginning, younger student like the TI-73, while others are for advanced calculus students, like the TI-89 Titanium (my TI-89 Titanium review). The TI-Nspire, however, brings you incredible power that is relatively simple to learn, especially if you’re already comfortable with computers. Today’s students grew up with dropdown menus, computer documents and folders, mouse pointers, click and drag interfaces. The TI-Nspire brings all of those features to a graphing calculator. Just try out the basic calculator features alone, and you’ll see what makes the Nspire superior. The resolution is so high, and you’ve got “mathprint” available for every function, meaning what you see in your book is exactly what you’ll type into the calculator. There’s very little calculator syntax to learn. Move on to the graphing features, and you’ll be even more impressed. Most of the features that use to require a lot of keystrokes (max, min, value, intercepts) are all found automatically by using the trace feature. Those that aren’t are found in logically laid out dropdown menus, so you never really have to leave the graph screen. And yes, since the release of TI-Nspire OS 3.0 in Spring of 2011, all TI-Nspire models have the ability to load photographs and graph in 3D. A lot of people are confused by the Nspire vs. the Nspire CAS. There is a significant difference. The TI-Nspire CAS has a computer algebra system. This means it can factor, solve equations, and simplify expressions involving variables like x and y. This does make the CAS version quite a bit more powerful. The CAS version is legal on the SAT and AP Calculus tests, but not the ACT. If you have an older “grayscale” TI-Nspire, you have the option to replace its keypad with a TI-84 keypad. That keypad makes the Nspire look and act exactly like a TI-84. This could be handy in situations where you want to use a specific TI-84 app or your teacher is teaching a lesson with the TI-84, although frankly, the Nspire is a lot more advanced than the 84. This keypad was included with the original release of the TI-Nspire and can now be found on Ebay. You should know it’s very easy to go from the TI-Nspire to the TI-Nspire CAS or vice versa. Their menu systems are virtually identical except for the extra options for the CAS, so once you’ve learned one of the two, you’ll understand both. TI-Nspire clickpad or TI-Nspire touchpad? The original TI-Nspire came with a keypad nicknamed “clickpad.” Today, they ship with a “touchpad.” Contrary to what some in the media have incorrectly reported, the TI-Nspire touchpad is NOT a touch screen calculator. The new touchpad acts like a computer touchpad, allowing the cursor to be manipulated like you would interact with a laptop computer. Texas Instruments also streamlined the design of the buttons with the touchpad, making it a much more efficient design. If you bought a TI-Nspire with clickpad, you can buy a new touchpad for under $20. You’ll just need to do a quick operating system upgrade to use it. Unfortunately, if you bought the TI-Nspire CAS with clickpad, it’s not possible to change the keypad. The new TI-Nspire CAS touchpad does have removable keypad (although it won’t accept the TI-84 keypad). What is the TI-Nspire CX? Texas Instruments has kicked it up a notch with their latest version of the TI-Nspire, the TI-Nspire CX. The new model has a color display, backlighting, and is much thinner than previous models. It runs exclusively on rechargeable batteries instead of AAA batteries. They have finally ditched the removable keypads, so there is no way to use the old TI-84 keypads, but with the TI-Nspire series starting to really take off, I don’t think that’s a big deal. I strongly suggest you read my TI-Nspire CX review to get a more full picture of where Texas Instruments is headed with its latest TI-Nspire model. I love the TI-Nspire. It’s ability to use true spreadsheets, load interactive documents, a high resolution grayscale display and much more make other graphing calculators seem dated by comparison. There are certainly other graphing calculators I can recommend, but from personal experience, the TI-Nspire is my favorite. My math team students love their TI-Nspire CAS’s, and after back-to-back-to-back top 3 finishes at the Illinois state championships, I wouldn’t have them on anything else.